A big part of golfing is of course the wardrobe. While no one needs to be a fashonista, it does help to be aware of the norms of the sport and what clothes fit what scenario. Let’s look at where to start with your golfing wardrobe. By following this advice you will not just look great, but feel great too. Starting with your top half, the classic golfing polo shirt is the standard upper body wear for golfers around the world. It has a neat yet casual look that is perfect for any golf course. Ideally the sleeve of the shirts should come halfway between your shoulder and elbow but never below. When it comes to colours and design there is a wealth of options available and in general, muted or dark colours are more practical as they are harder to stain when compared to light colours like white or beige. If your golf club has no specific rules or dress code, you should simply pick the colours and designs you feel most confident in. If you feel a bit flashy, don’t worry about picking up something bright, as long as it is in good taste. What is of critical importance however is the material you pick for your shirt. Cotton is great all-rounder and offers ventilation and comfort. That said there are many benefits to modern artificial fibres that can offer you odour or stain resistance along with a protective material that breaths well. Many golfers are allergic to synthetic material which is also a big factor in cotton’s continued popularity in shirt manufacturing. Your main focus with golf pants are comfort. Pants should be loose fitting and breathable. Unlike with Golf shirts, your pants should focus more on the practicality of the materials as you will be washing your pants a lot. It is also helpful to make sure your pants pockets can accommodate a few golf balls, tees and of course your Smartphone with all your favourite Australian betting apps. Cotton pants are again a great option but they usually require ironing. Easy care cotton pants are blended with polyester so they are even easier to keep clean. Microfiber ad pure polyester pants are the easiest to take care of and usually are very stain resistant thanks to their synthetic fibres. At the end of the day, you should try on a few materials and see which feel best for you and allow you to move comfortably. When it comes to the correct pant length, the general consensus is the pants should just touch the tops of your shoes. Main golf clubs ban shoes with metal spikes so more likely than not the spiked golf shoes you find in stores will have plastic spikes on the bottom. Spikes are not a necessity but they do give better grip not just in tough terrain, but also during your standard swing s the spikes provide more grip and therefore more stability. 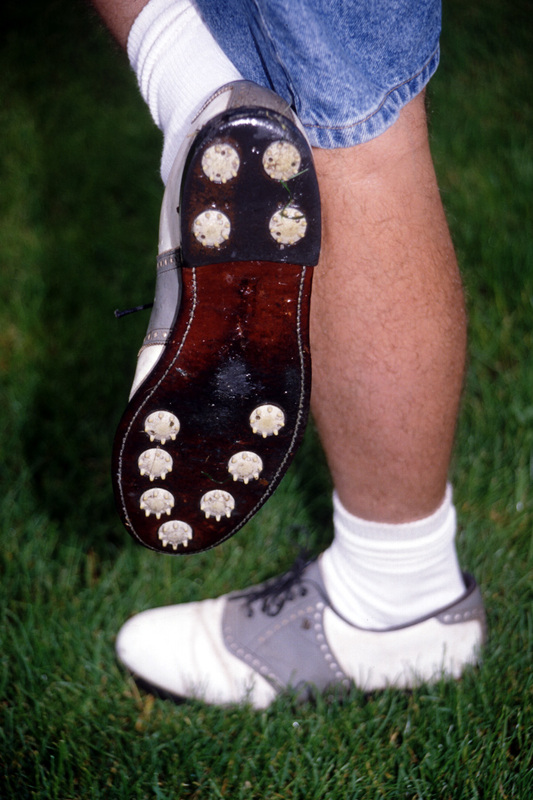 While you may need to keep an extra pair of shoes to wear for the club house, spiked shoes are well worth it. For me when it comes to the best materials for shoes, synthetic materials are easier to keep clean and are often cheaper, but leather shoes wear better and they always look great.